Disposable, Nitrile Exam Gloves Are Perfect For Lab Work, Chemical Handling, Small Parts Handling And Food Preparation. Nonsterile, 8 Mil Construction Is Chemical-Resistant And Puncture-Resistant. Textured Grip Provides A Secure Hold. Beaded Cuff Increases Glove Strength When Donning And Helps Prevent Liquid From Dripping Onto Your Forearm. The 12" Long, Size Large Gloves Also Feature A Powder-Free Surface So You Won'T Get Powder On Your Clothes. 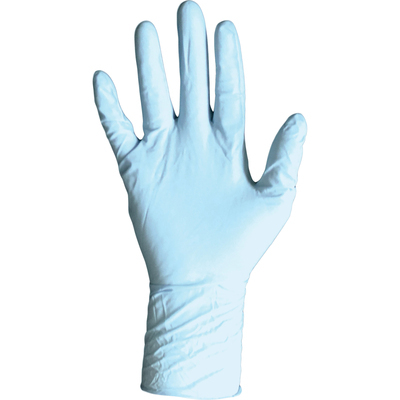 Each Disposable Nitrile Powder-Free Exam Glove Can Be Worn On The Right Or Left Hand.. Disposable, Nitrile Exam Gloves Are Perfect For Lab Work, Chemical Handling, Small Parts Handling And Food Preparation. Nonsterile, 8 Mil Construction Is Chemical-Resistant And Puncture-Resistant. Textured Grip Provides A Secure Hold. Beaded Cuff Increases Glove Strength When Donning And Helps Prevent Liquid From Dripping Onto Your Forearm. The 12" Long, Size Large Gloves Also Feature A Powder-Free Surface So You Won'T Get Powder On Your Clothes. Each Disposable Nitrile Powder-Free Exam Glove Can Be Worn On The Right Or Left Hand.